What is your favorite recipe for when you’re busy? Oh man, my life has been so upside down lately. But in a good way! I have been really dedicated to studying blogging – reading books, listening to podcasts, participating in Facebook groups, going to conferences and everything. All this while managing to post 3 times a week, taking care of my little family and working full time on Broadway. My brain literally works 24/7, which is making it impossible for me to sleep at night. I guess that’s what happens when you’re passionate about your work. There’s no 9-5! You’re thinking about it all the time. ‘How can I get better?’ is the question that keeps popping in my mind all the time. I wanna excel at every single aspect of my life. I wanna be a better cook, a better blogger, a better wife, a better dog mommy. I wanna keep my apartment in better shape! I wanna cook my week’s meals ahead of time so I don’t have to come from work at 11pm and go to the kitchen! But, unfortunately, I’m not an organized person and I’m totally a procrastinator. So sometimes, in the middle of all that madness, I come home from work and realize we have nothing to eat. Oh well, thank God for Spaghetti with Simple Marinara Sauce, the recipe that I have up my sleeve for days like that. As a good Italian descendent, three things I ALWAYS have available in my pantry are dried pasta (usually spaghetti), cans of peeled tomatoes (San Marzano, of course!) and extra virgin olive oil. Those 3 ingredients alone can make a delicious sauce! However, the sauce gets even better with the addition of garlic and basil. Oh, and let’s not forget the Parmigiano Reggiano. Even though, traditionally, the marinara sauce isn’t supposed to be served with cheese. But I simply cannot live without Parmigiano Reggiano! (Can you?) Like, seriously, can it get any better than that? My point is: it’s okay if you can’t cook a 4 hour meal today. Recipes like this one are equally delicious. You just need fresh, simple ingredients. Let THEM do the work for you! This recipe is as easy as putting the ingredients in a pan and letting them cook for 15 minutes. Dinner will be on the table in less than 30 minutes and, let’s face it, who doesn’t love a bowl of delicious spaghetti marinara? In a large bowl, add the peeled tomatoes and mash them with a potato masher. If you don't like your sauce chunky, you can blend the tomatoes in the blender until smooth. Reserve. In a large skittlet, heat the olive oil over medium high heat and sauté the garlic for a couple of minutes. Be careful not to brown it. Add the tomatoes and the basil and stir. Once it boils, turn the heat down to low and let it simmer, covered, for 15 minutes. While the sauce is simmering, cook the spaghetti in a large pot of salted boiling water, according to package instructions. After the sauce has been simmering for 15 minutes, season with salt and pepper and taste to see if needs sugar. If it's too acidic, add a pinch of sugar. 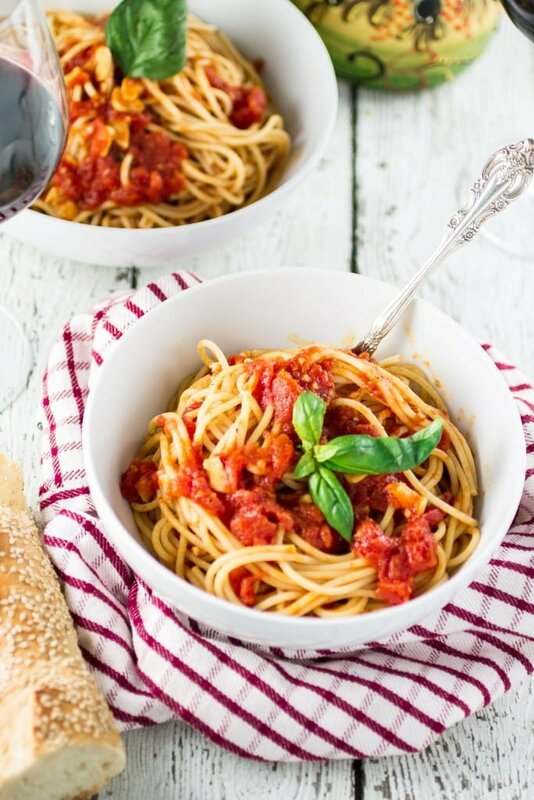 To serve, just toss the pasta with the sauce to coat and decorate with some basil leaves. Don't forget the Parmigiano Reggiano on the side, to please the cheese lovers like me! Wanna keep in touch? Follow me on Pinterest, Instagram, Twitter and Facebook to stay up to date with all my posts! :) I appreciate the support! We probably eat this dish on a weekly basis because it is a family favourite! You are right, it is so easy to make and packed with flavour so pleasure is always guaranteed. Oh wow your mum is an opera singer?This is awesome, I love opera, is it possible to watch her singing somewhere on the internet, maybe ‘you tube’? Thanks for reminding me how delicious spaghetti marinara is Olivia.. cannot remember the last time I actually indulged in a bowlful & am determined to now! I can hear you, life has become so busy! And on top of it we are looking for a house so it’s like weekends are totally dedicated to house hunting. I wish there were more than 24 hours in a day! Pasta and marinara is the best staple to have on hand. I couldn’t imagine having it without cheese either! Your mom is an opera singer? That’s so interesting. I can see where you get your flair for acting!